You know the saying, “When the teacher is ready the students appear”? (Or is it the other way around? I think it is. As a freelance teacher I always tend to wonder if students will show up…) I’ve been having a recurring idea and I guess I’ve been in need of a nudge. So, students, show up, please. I mean, there’s just SO MUCH to work on all the time. Do y’all really want me to stop working and start organizing? 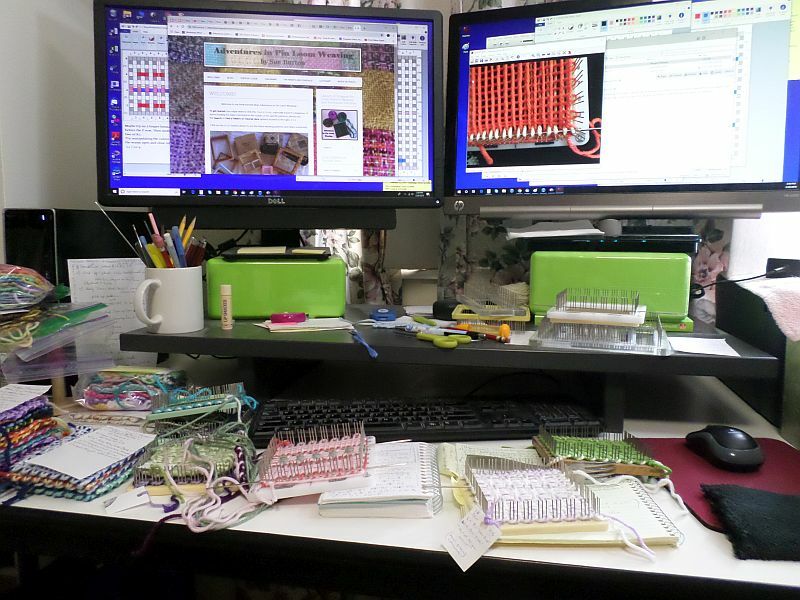 First, check the PIN WRAPS AND YARDAGE page (see tab at the top of this blog) to see if I’ve already figured it out for you. 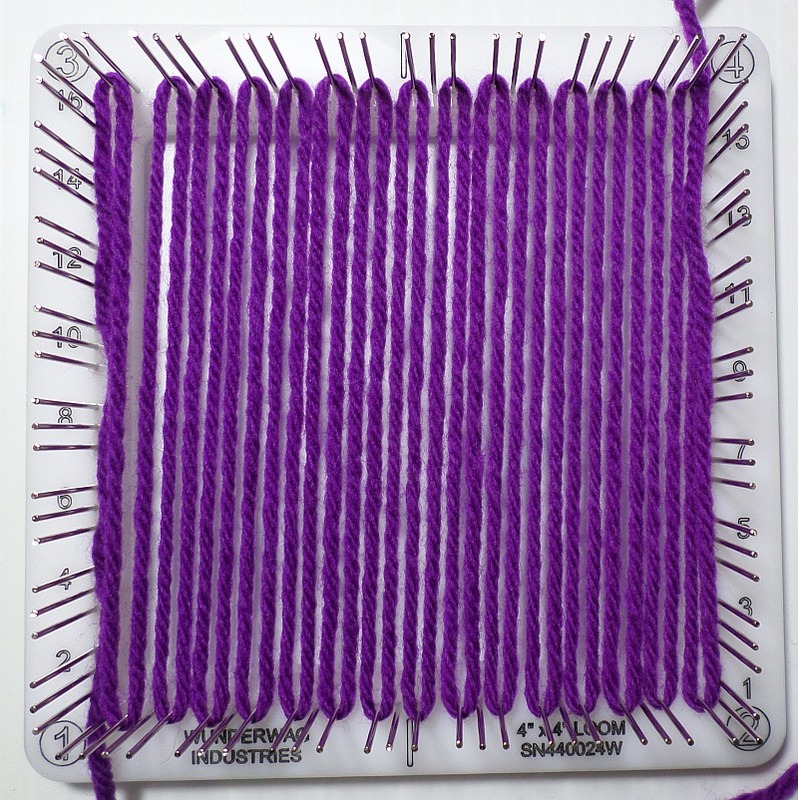 If your loom size isn’t covered there, or if you’re on a desert island (you brought your pin loom weaving supplies of course) and don’t have access to the Internet, I’ve discovered a Helpful Hack for measuring weft. I ran across an index card a few days ago. It had a weaving pattern scrawled on it, but no record of whether or not I’d woven it (no notation of yarn or color used). 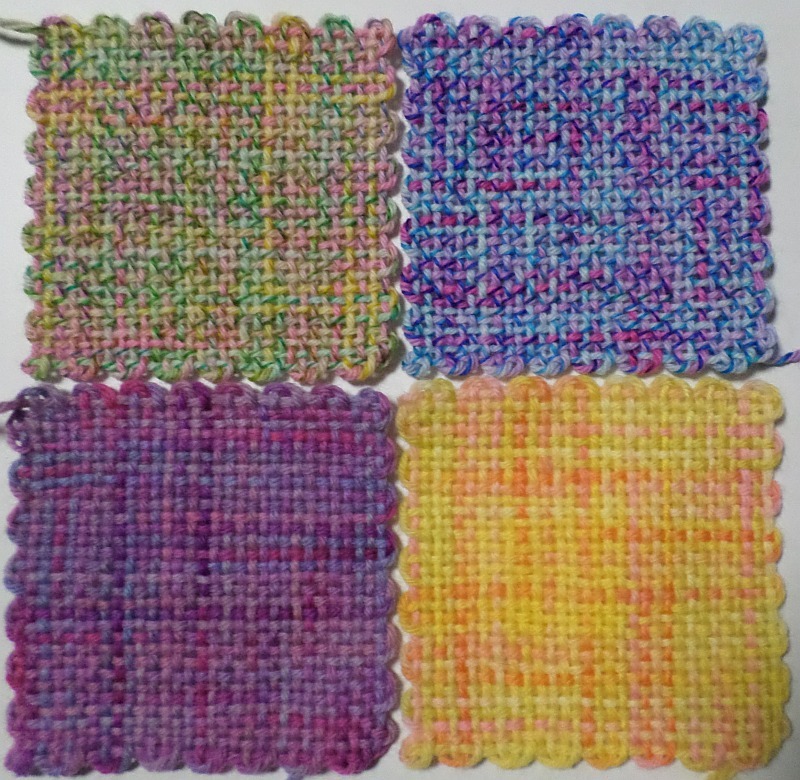 Someone on the Facebook Pin Loom Weaving Support Group asked me the difference between single-layer warping (1LW) and two-layer warping (2LW): Why couldn’t you lay all the warps side by side instead of going through the two-layer process? I laid out a square with all the warps side by side and counted to make sure I had 31. 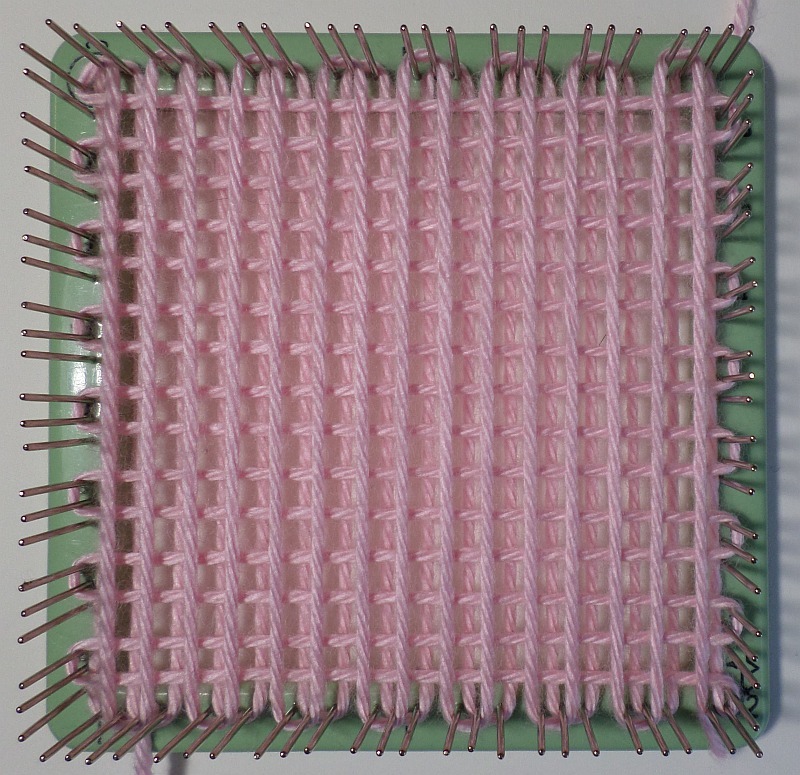 In hindsight, I could have moved the warp at Cr3 over to the second pin. I also could have tried warping beginning at Cr4 or Cr3 or Cr2 … or even one of the sides (it’s like anarchy, isn’t it, when you abolish the rules?) I didn’t like the unvertical way it looked, but it’s interesting that weaving begins at Cr4—if you don’t tie on a second color. If you do tie on a second color, you could add it at any corner (more anarchy!). 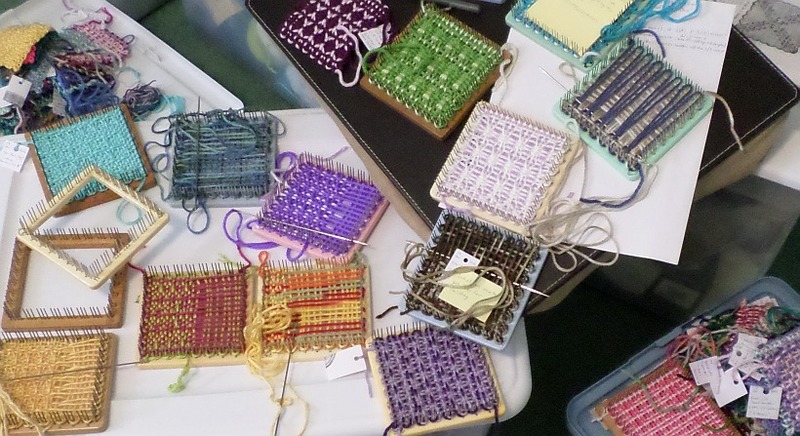 Weaving with two or more colors is a great way to enhance and enliven your weaving. 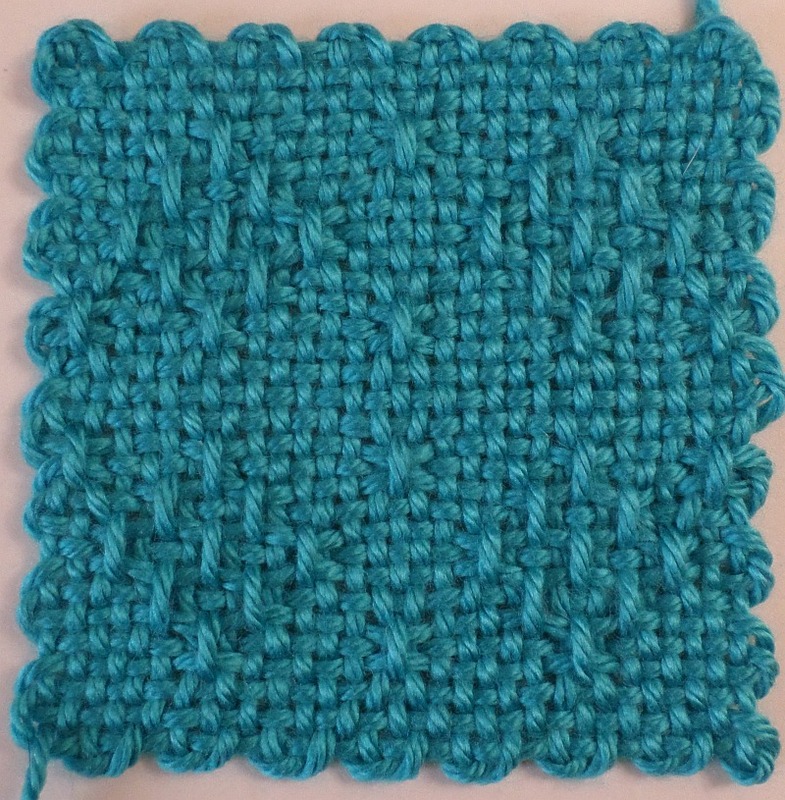 Though it’s annoying to weave in ends, I find it’s worth the effort because it’s fun to use two colors and the results are often beautiful. (I developed a method of working in ends as I go—see links at the bottom of this post).